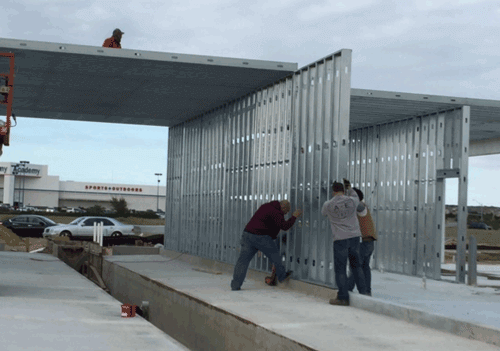 Generally, quick lube buildings are constructed in concrete block or framed with metal or wood. Both construction methods yield a solid building, however, they are some distinct differences that warrant some thought. With concrete block construction, you have to surface mount the plumbing and electrical wiring which is more expensive to do that running the wires through walls. And in order to disguise the pipes and wiring conduit, you have to paint it, which is a lot of labor and some expense. About the only way to insulate a block wall is to fill it with concrete, which is expensive, or to furr out the interior walls which adds to the expense. A block building exterior is hard to dress up. About the only way to do it is to furr-out the exterior and use another exterior material, like EIFS. However, this measure is costly when you factor the price of the block, furring strips and additional cladding. Pre-Engineered construction builds the framing offsite during the dirt work phase of the project, which means there is a savings of 4+ weeks construction time. A block building, because it must be constructed on site is not eligible. Electric and Plumbing is run in the walls – out of sight and out of mind. No surface mount. No disguising. The walls can be finished with drywall, FRP or PVC plastic, depending on the need. Steel-Framed walls can be easily insulated with pink panther insulation. Do you want a building clad in EIFS, thin-brick, stone veneer or some combination? The steel framing gives the flexibility to do what you want. The steel framing for a building can be manufactured offsite at the same time the dirt work is happening, therefore, shaving off 4+ weeks of total construction time. Steel has international demand the prices can vary from time to time.